OAKLAND — Edith Grace Brock, 96, of Oakland, died on Tuesday, March 15, 2016, at the Dennett Road Manor Nursing Home. Born on June 17, 1919, in Auburn, N.Y., she was the daughter of the late Walter Burritt and Mabel Louise (Chapin) Brock. Edith was a graduate of Oakland High School, Wilson College in Chambersburg, Pa., and Carnegie Tech Library School. She worked for several years for the Cleveland Public Library prior to coming back to Garrett County, where she was, in 1950, the first trained librarian in the county. Early on, she drove the bookmobile along the winding mountain roads to all of the coal mining towns. 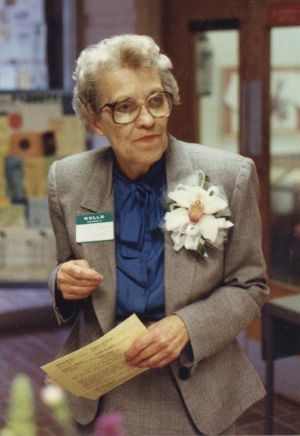 As director of the Ruth Enlow Library, Edith saw the establishment of branches throughout the county and was instrumental in the training of future librarians. She formally retired from the library in 1992, but continued to volunteer her time for many years thereafter. She was a member of the Bethel United Methodist Church in Mountain Lake Park for many years. She was a member of the AAUW in Garrett County, for which her mother was the founder. Additional memberships included the League of Women Voters and the Women’s Civic Club. She was inducted into the Garrett County Women’s Hall of Fame in 1997. Edith had a love for classical music, opera and plays; she enjoyed attending performances at Penn Alps, several regional theaters including Our Town Theatre, and attending the opera in Pittsburgh. Edith was raised in an environment where the education of women was valued and lived her life promoting the education of women in Garrett County. She is survived by her brother-in-law, Dr. Herbert Leighton of Oakland and his family; as well as, numerous nieces, nephews, great-nieces, great-nephews and dear friends. In addition to her parents, she was preceded in death by her five siblings and was the last surviving member of her immediate family. Friends will be received at the C & S Fredlock Funeral Home, P.A., 21 N. 2nd St., Oakland, on Tuesday, March 22, 2016, from 2 to 4 and 6 to 8 p.m.
A funeral service will be conducted in Saint Paul’s United Methodist Church, 318 E. Oak St., Oakland, on Wednesday, March 23, 2016, at 11 a.m. with Pastor Matthew A. Paugh officiating.